The Journey: Private Flight Test! The long space between posts can mean only one thing...I was working hard on getting to my private flight test. On Thursday the 8th of March, the day finally came. The examiner flew her little 150 down from Red Deer where she works as an instructor the rest of the time. She's easy-going and reminds me a lot of our wedding photographer, for those of you who remember, always happy and trying to make you feel comfortable. The test is broken down into individual tasks and knowledge areas. Each is marked out of 4 points. 1 is a failure, 2 is a below-average but still a pass, 3 is standard knowledge and 4 is excellent or above average knowledge or skill. She starts with about 20 minutes of oral questions which was the part I was dreading! If you get a 1 on anything on the ground, then the test is over and you don't go flying. I got a little confused as to where to locate some specific numbers relating to the weight of the aircraft with the aftermarket equipment installed. I got a 2 out of 4 on that. But the rest were 3's and 4's. Anyway, the flight went great. Navigating, diverting to an alternate, stalls, slow flight, steep turns, instrument flight – all top marks, which was a relief. 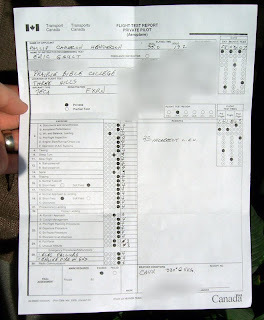 Here's a photo of the test result. All that matters is that I passed and that I have this piece of paper in my hand. Next I just have to write the written part and I'll have my license! Anybody want to go for a flight!